Wingu Tingima was born at Nyumun in the western desert region of Western Australia. She grew up with her family in the bush before travelling by foot with her mother and father to the mission at Ernabella. Here she worked spinning sheep's wool to make items for the mission and has said, "I wasn't worrying to go home because I was happy at the mission." Tingima now lives at Nyapari, but also spends a great deal of time at Irrunytju. She was instrumental in establishing the Irrunytju Art Centre and now works predominantly through Tjungu Palya Artists. Tingima first exhibited in Nganampa tjukurpa kunpu, Nganampa tjukurpa mulapa (Our stories are strong, Our stories are true), Vivien Anderson Gallery, Melbourne, 2002. 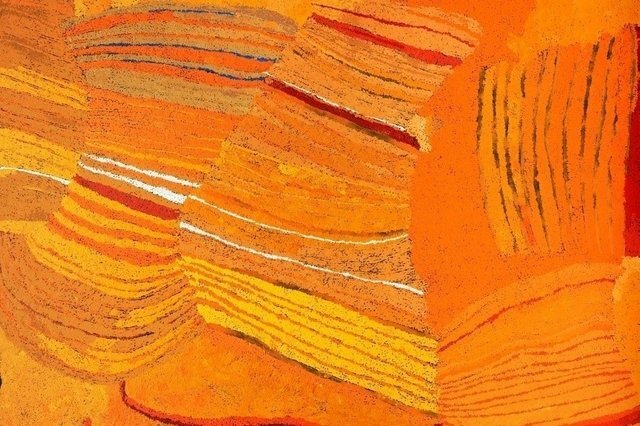 She has since been included in Desert mob, Araluen Art Centre, Alice Springs, 2002 and was selected for the Telstra National Aboriginal and Torres Strait Islander Art Award, Museum and Art Gallery of the Northern Territory, Darwin, 2003. The art centre documentation states: This is Kuru Ala, a sacred place for the Seven Sisters Story. Kangkuru munu Malanypa nyinanyi (the older sister is sitting with her younger sister). All the sisters were travelling through this country. One cheeky many, Wati Nyiiru was chasing the sisters all over. He was a Ngankuri (magician) and could change into many things to trick the sisters. He changed into a quandong tree, but when the sisters tasted it they knew it wasn’t quite right. This country is in Western Australia.